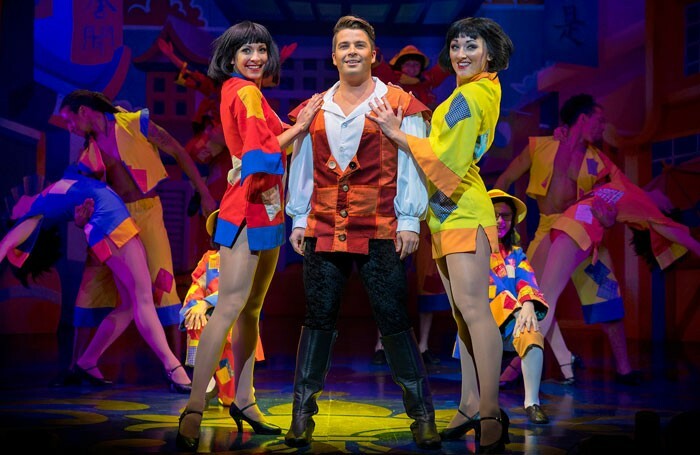 A largely routine first half ends with a truly spectacular flying carpet scene in which a singing Aladdin (Joe McElderry) glides majestically over the audience, frequently tilting at impossible angles and prompting genuine gasps of amazement from excited onlookers. It’s almost a proverbial “game of two halves”, because what follows after the break is in a different league to much of what goes before, including markedly more glamorous sets and more imaginative routines – kicking off with a lavish money-themed song and dance medley led brilliantly by Ian Adams’ wonderful Widow Twankey. And when he later joins forces with Slave of the Ring (Lisa Riley), Wishee Washee (Adam C Booth) and PC Ping Pong (Ben Faulks) for a hilarious, perfectly choreographed Peking take on If I Were Not Upon the Stage, the team bring the house down. The fine voices of Adams and Stefan Pejic (Abanazar) are a real treat, while Booth works the audience well with his cheeky charm. But the surprise star of the show is the Black Country’s own living legend, the fictitious welfare-sponging Doreen Tipton (the Lazy Empress). With her regional yam yam accent and Lazy Cow persona, Tipton (un-credited as the real Gill Jordan) has some of the funniest lines in the show.